In 2006 a group of mice-astronauts will orbit Earth inside a spinning spacecraft. Their mission: to learn what its like to live on Mars. January 20, 2004: Humans need gravity. Without it, as astronauts have vividly demonstrated, our bodies change strangely. Muscles lose mass, and bones lose density. Even the ability to balance deteriorates. From long experience on the space shuttle and various space stations, we have some knowledge of how mammals, especially people, respond to 0-g. We have even more experience with 1-g on Earth. But we still don't know what happens in between. What, for example, will happen to humans on Mars where the surface gravity is 0.38-g? Is that enough to keep human explorers functioning properly? And, importantly, how easily will they readapt to 1-g, once they return to Earth? A team of scientists and students from the Massachusetts Institute of Technology (MIT), the University of Washington, and the University of Queensland, in Australia, plans to explore these questions. They're going to do it by launching mice into orbit. "What we're doing," explains Paul Wooster, of MIT, and program manager of the Mars Gravity Biosatellite project "is developing a spacecraft that is going to spin to create artificial gravity." The satellite will spin at the rate of about 34 times each minute, which will generate 0.38-g -- the same as gravity on Mars. 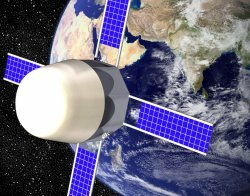 The team hopes to launch the Biosatellite in 2006. 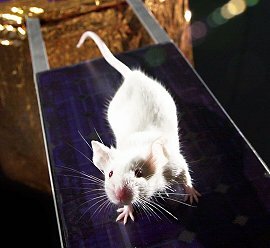 The mice will be exposed to Mars-gravity for about five weeks. Then, says Wooster, they'll return to Earth alive and well. The mice will descend by parachute and land near Woomera, Australia, inside a small capsule reminiscent of NASA's old Apollo capsules. The Biosatellite project is the first investigation conducted at this gravity level, says Wooster. Financed in part by NASA, the project is also unique "due to the heavy involvement of students in all aspects of the work, including planning the science, designing the spacecraft, raising the funds, and managing the overall effort," he adds. The research will focus on bone loss, changes in bone structure, on muscle atrophy, and on changes in the inner ear, which affects balance. "The main thing we're trying to do," says Wooster, "is to chart a data-point between zero-gravity and one-gravity." As they orbit the earth, the mice, each in its own tiny habitat, will be painstakingly observed. Each habitat will have a camera, so that the researchers can monitor mouse activity. Each will have its own pump-driven water supply, so that each mouse's water consumption can be tracked. Each mouse's wastes will be collected in a compartment beneath its habitat; the compartment will contain a urinalysis system checking for biomarkers that indicate bone loss. Each habitat will also be equipped with a body mass sensor, which will take frequent readings. This will also allow the researchers to track how the weight of the mice changes over the course of the five weeks. Each mouse will also have toys to keep it busy. "We may give them a wooden block to chew on," says Wooster. That'll keep them happy, and will also prevent them from chewing on the habitat. They might have a small tube to run through. No wheels, though, says Wooster, because NASA has learned that exercise can counteract some of the effects of low-gravity on astronauts. A mouse with a wheel in its cage can actually run several miles a day. "We don't want to give the mice a countermeasure in terms of exercise." The students will be using only female mice, says Wooster. That's partly because female mice eat slightly less than male mice, decreasing the mass that must leave Earth. But more importantly, some studies suggest that females are affected more strongly by lowered gravity than the males. Those studies, though, weren't conducted in true partial gravity. Rather, they were done by suspending the hind legs of the animals, so that the mice are only able to feel part of their weight on the ground. The simulated Mars gravity inside the Biosatellite will be much more realistic. Through the three participating universities, more than 250 students have been involved in the Biosatellite project. The project is being led and coordinated by MIT, which is also managing the animal habitats and life support systems. The University of Washington is in charge of providing electrical power, propulsion, attitude control, thermal control, and all the communications to the ground. The University of Queensland is in charge of the entry, descent, and landing systems, including the heat shields and parachutes. "I think that one of the big contributions of the Biosatellite," says Wooster, "is the educational benefit for the students involved." So many people, he says, have been inspired by this project, and have learned from it. "Plus we're going to be getting back information that nobody's ever had before, data that have been missing in the planning of human missions to Mars." How might humans respond to gravity on Mars? With the successful landing of NASA's rover Spirit, that question seems closer and closer to one we'll need to solve.